Thank you so much to everyone that came out for our 2nd Annual Virago Fundraiser hosted at Bitter Brothers Brewing Co. We raised a little over $2500 for the F.I.T. Project! We were overwhelmed by the support of our friends, family, Virago Warriors, and the new friends we made that night! Without all of you none of this would be possible. A very special thank you to Connie Jurgens, our photographer, for the incredibly generous donation you made to Virago, and for the fun and awesome photos you took. Thank you to Craig, the winner of the 50/50 raffle for donating the pot back to Virago, thank you to all of the attendees who bid and/or won the silent auction prizes. Another huge thank you to all of the sponsors who donated prizes to the auction. Virago Fundraisers are held quarterly. Please make sure you join us for the next one! Megan Eccles checking out the silent auction prizes. The President’s father, David, enjoying his Golden Child Brew and taking it all in. Vice President, Graham, with the most important job of the night. Everyone showed up in their Virago gear to show their support! Our Board Member, Sara, being social. Huge thank you to Bitter Brothers for hosting our annual fundraiser for the second year in a row! Matt Faye, Sara’s better half, and our merch booth extraordinaire! Kavon, Jillian’s Hubby, ALWAYS representing his favorite nonprofit. Heather’s boyfriend, Chris, looking dapper as usual. Our Secretary of the board, Jillian, taking a well deserved break from check-in duty. Our president, Brittney (left) with one of her best friends, Chanel (right). Chase and his girl, Coco, stealing the show. The Virago Board of Directors and officers (Just missing Ryan) celebrating an amazing fundraiser. Our Founder & President, Brittney Hogan, was interviewed by SD Voyager! Here at Virago, we believe that wellness is a way of life. We don't believe in extreme dieting or crash diets for weight loss that you only practice for a certain period of time. Health and fitness is a lifestyle that you must commit to fully. Which means you should be eating for long-term health. That's why we are working on putting together the ultimate healthy eating guide. We are excited to announce that we are teaming up with Allie Hobson of Barefood Nutrition. Allie is a Nutritional Therapy Practitioner, and while trained to provide programs and protocols to assist individuals in achieving their personal health goals, she wanted to create a basic alternative that anyone could follow to create long-term healthy eating habits. This project has been a long time in the making, and we are almost ready to release it. But first, we need your help! We want to make sure that we are giving you the guidance you need. Thank you for your feedback! If you'd like to be notified about the launch - subscribe to our e-newsletter. The Warrior Built Foundation is a non-profit organization located in the city of Lake Elsinore that focuses on vocational and recreational therapy specifically for combat veterans. Their cornerstone project includes giving these men and women the opportunity to bond and open up with one another through the process of building vehicles which the WBF team of veterans then race in competitions. Outside of the therapeutic conversations that arise during these builds, working on every type of vehicle from " an off-road to a race car to a motorcycle, also gives them a chance to figure out if they want a future in the fabrication and mechanic industry" says founder and former marine, retired First Sargent Nick Hamm. The ultimate goal is to "foster an environment of healing, where great memories are born and new support systems are formed" and as far as #teamvirago is concerned from what we have seen, that goal has been achieved. The therapeutic benefits of the mechanical projects are obvious both internally and socially for the former service members who come to WBF to find tranquility, but this facility is much more than just a garage. Their massive HQ also includes a rock star worthy music studio where veterans are taught to play instruments by fellow veterans and are even encouraged to write their own music. The second floor of this sanctum also has a man cave where group therapy sessions are held. The man-cave amenities include access to computers, printers, snacks, gaming systems and a huge flat screen tv. This pillar for post traumatic growth even has an onsite gym filled with special equipment built to work best for people with major injuries or lingering physical pain from trauma. The foundation also organizes community events, awesome field trips, a new photography class, and even have programs to help "combat veterans pursue their desires to enter and compete in different types of action sports and races such as the Baja 1000 off-road race". After #teamvirago toured the facility, Virago's founder, Brittney Hogan, was given the honor of being invited to sign the "wall of warriors" on behave of herself and her late husband, Marine LCpl Hunter Hogan. As she began to write their names, a few of the warriors began to choke up as their fallen brother's call sign was added to the list of survivors and fallen soldiers that embellished the wall. Seeing these amazing men honor the sacrifice that Hunter had made for our country was a big moment for our organization, and soon the visit became just as therapeutic for us as this foundation is for hundreds of combat veterans. We could not be more excited about this partnership and cannot wait to visit and work with them again! On Tuesday, July 18th, just as the nectarine-orange sunset came to a close, market lighting illuminated the industrial facade of the brewery where #TeamVirago gathered for the much anticipated Virago Fitness Non-Profit Launch Party! 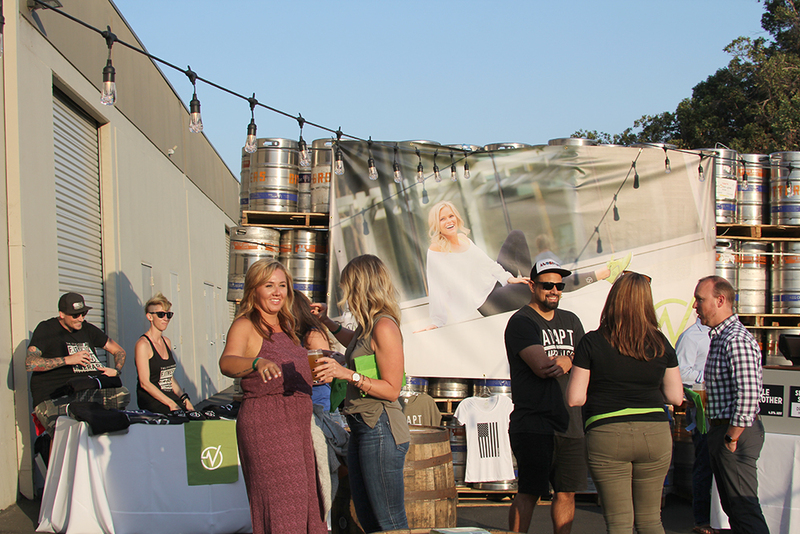 Like all things Virago, the energy of this brewery bash was electric with excitement to celebrate all that Virago Fitness has accomplished and all that Virago Fitness NPO plans to achieve. This party was also an opportunity to debut our newest programs which included F.I.T (Fitness is Therapy), the Virago Warrior initiative, and our sponsorship program which will include a three-month exercise schedule, a personal trainer, a nutrition plan and a regional support team. Bitter Brothers Brewing Co, a local San Diego micro-brewery, not only donated their space, their service, and their beer but also provided the perfect ambiance to celebrate this socially conscious launch. The delicious organic appetizers were provided by the farmers and caterers of Little Mountain Farm Co and paired perfectly with the Bitter Brothers' beer. You could barely hear the six part raffle over the laughter and triumph of the night. Overall, it was a total success! We owe special thanks to all the business who donated prizes for the raffle which included everything from a chocolate factory tour to free bike rentals and free fitness packages. This launch raised money and awareness about the benefits of fitness for post traumatic growth and would not have been such a success without the support of the fitness community, our amazing brand ambassadors, all who were in attendance and all of you who follow and support us from all over the world. Explore our ever evolving website and discover other ways you can join the movement! Check out the speech below where our fearless leader, visionary founder, and gold star wife Brittney Hogan tells her story and explains our mission. Hi friends - Brittney Hogan here! A few weeks ago I was presented with an amazing opportunity. The Marine Corps Toys for Tots asked if I would like to be featured in a segment on the Hollywood Christmas Parade. Of course I said yes! Everyone involved was as sweet as could be. We had such a lovely time in Hollywood, and really enjoyed walking the red carpet. A huge thanks to Montel Williams for interviewing me. It was a pleasure to meet him! If you missed the interview, it is airing again on national television this Wednesday the 21 of December at 8PM/7PM CT on the Hallmark Channel and the CW.